Google has already made it clear several times that News Boxes on Google SERPs (search engine results pages) don’t only contain articles from publishers who are indexed in Google News, but the ratio of articles from indexed publishers to non-indexed publishers have not been clarified so far. 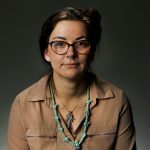 – Are there certain categories of keywords that publishers who are not in Google News rank especially well for in the News Boxes? The News Dashboard SEO tool looks at Google search visibility. For this analysis, we focused on imported keywords – Google News Topics and Google News Related – which are made up of the “trending” or top news topics on Google News at any given time during the analysis, as well as manually entered keywords during the above time period. Each Google News category – from Top Stories to Entertainment, World, Sports, Technology and more – is considered. Examples of Google News, a desktop Google News Box and Mobile Google News Box. 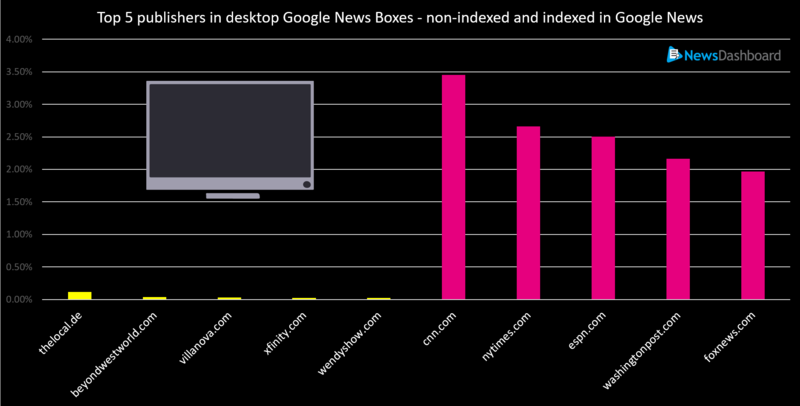 The yellow bars indicate publishers that were not indexed in Google News, while the pink bars indicate publishers that were indexed. The data is for December 2017. Interestingly, the percentage of indexed publishers in the desktop News Boxes is quite a bit more than we saw in Germany, where it was a 92.2 percent/7.8 percent split. The five most successful keywords for non-indexed publishers were: westworld, villanova wildcats men’s basketball, wendy williams, comcast and wichita state shockers men’s basketball. When we switch over to mobile, the story is quite different, with 97.84 percent of rankings from Google News indexed publishers vs. a much larger 2.16 percent of rankings from non-indexed publishers. As many news websites are more and more focused on mobile, this is an important distinction. thelocal.de: A German news site in English, and the only website that appears in both the desktop and mobile News Box lists. Again, the percentage of Google News indexed publishers in the mobile News Boxes are much higher than in Germany, which saws a 93.20 percent / 6.78 percent split. The five most successful keywords for non-indexed publishers were: india, narendra modi, bitcoin, germany and refugee crisis. The Top 5 most successful keywords for Google News indexed publishers in desktop News Boxes included politics, science and sports (clinton, lavar ball, paul manafort, trump immigration and nasa); while the same for mobile News boxes were all business topics (s&p 500, nasdaq:aapl, nasdaq:tsla, ge stock and dow jones industrial average). Of the top 100 keywords in desktop News Boxes for non-indexed Publishers, news topics, especially concerning the German election, were the top category. On the mobile side, news topics were also squarely the top category, but with much less focus on the election. What conclusions can we draw from these findings? It’s worth it for news publishers to get their websites indexed on Google News in virtually all areas. While the News Boxes can contain non-Google News indexed websites, the majority of rankings are indexed publishers. Although this is not necessarily due just to indexing, you will also get the possibility of ranking on the Google News page in addition to the News Boxes.